FPS fans have been clamouring to relive the horrors of World War 2 since about the second Modern Warfare, and that sentiment has been growing with each near-future shooter pumped out by EA and Activision. 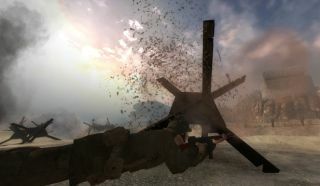 New World Interactive, developer of squad firefight sim Insurgency, has been paying attention: in collaboration with the modding community, it has officially released Day of Infamy, a WW2 total conversion. I say 'officially' because it's been cooking for a while but can now be played without opting into the Insurgency beta build—the community isn't nearly done with it. Despite a five-star rating on the Steam Workshop, the Day of Infamy roadmap lists a raft of tweaks, retextures, vehicles and other assets to be added, all crowdsourced from Insurgency modders. Submissions remain open, too, so if you've got a bit of talent and a passion for the hardware and battlegrounds of the second world war, offer up your goods via GitHub. This update implements the first community map, Landfall by Chief-C, in addition to prettifying a German grenade an no longer referring to combatants as 'Security' and 'Insurgents'. It's a colossal project, mercifully available in one package on the Steam Workshop, and offers a huge amount of extra dev-approved value to Insurgency owners. Leif did our review—there aren't many games that reward teamwork better.